ghost face courtesy of estee lauder double wear! 001. So its been a bit of a crazy week, but back to normality come tomorrow. Back to healthy eating, gymming, enough sleep & completing all my daily tasks. I really want to get my routine sorted now that I'm not in education or working! I'm going to Ikea with my Mum tomorrow as she wants to take a look at the sale, it looks amazing online so I'm hoping for some bargains. I mainly want some storage boxes and a storage tower for all my jewellery, tights, socks and other bits and bobs! 002. I got my university results on Saturday morning, and I'm pleased to say I got a 2:1, which considering I've really put in minimal effort in the last year I'm happy I managed to achieve it. I've said it before I love art and design, but the actual "making" doesn't interest me half as much as it used to. I think graphics is something I'm glad I've got a degree in, the transferable skills are pretty much endless, but at the end of the day its time to focus on getting the career I really want! Which I still dont know what I want to do! 003. I've ombre'd my hair again, and its SUPER blonde, I mean blonder than I've been since I was about 7 years old! I used BBlonde Creme by Jerome Russel this time which is MUCH harsher than the highlighting kits I've used in the past. I kinda want to go full blonde now I've done it but I might see if the hair dresser can do it at a later date. I've said before I think Ombre is a bit done to death now, but I guess its a thing my blogs known for! Lay off the "I liked you better when..." comments, they aren't nice & a little unnecessary! 004. I met a few people in London who recognized me which was really lovely! Im such a awkward turtle when I meet people who know my blog! Had these really sweet girls corner me in Topshop and tell me how much they liked my blog, and I was so embarrassed and shocked I didn't know what to say! Thanks for saying hi though! Its funny and overwhelming being in London because at home no one knows who I am, even people who I've lived in the same town with for years don't know me! 005. Updated the shop, I've restocked lots of the oversized turquoise ring styles & a lot of the necklaces. I've also updated with new necklaces and a few new rings. I've also added a multi buy option to the small turquoise rings (black will follow once I sort the stock!) so its now 3 random style rings for £8 like the natural stone rings. The discount code "AWAYFROMKEYBOARD" will still be active till the end of Tuesday! All orders made when I have been away have either been sent or are going out first thing tomorrow morning! I've also replied to all emails about the shop, but if I've missed anything just mail me again! I always have stuffed inbox (I really need to set up a separate signing up to websites account!) so I do occasionally miss them! I love love love how blonde the ombre is! Your hair is always so lovely! Good luck with bargain hunting, in Ikea there's always good stuff so you should be successful! I think the new blonder ombre is fabulous! Looks amazing! i think it suits you lily. I love your hair :). Must be nice to be recognised! Well done on the 2:1!!! Oh, and just want to say thanks for the lovely ring from your shop :) recieved it a couple of days ago and haven't stopped wearing it! Love your hair, you are gorgeous!! I love your hair, you look amazing ! and congrats on your uni results, thats great! I love the ombre hair!!! You did it so well too! Don't worry about the others it looks fantastic on you. i LOVE the super blonde ombre on you. it definitely fits you. You are SO Gorgeous!!! Love this pic! And that is awesome that people recognised you from your blog!! You have accomplished so much:) Very inspiring! your hair can seriously pull off anything! have you seen this style(http://thebeautydepartment.com/wp-content/uploads/2011/07/TBDlaurenhaircolorpinkblue.jpg) been popping up? I have! That there is Lauren Conrad from the Hills. I think that looks lovely but I don't think I could ever do it to my hair. That and I would fear that it wouldn't go well with a lot of clothes. This is really really good photo of you. Very beautiful! 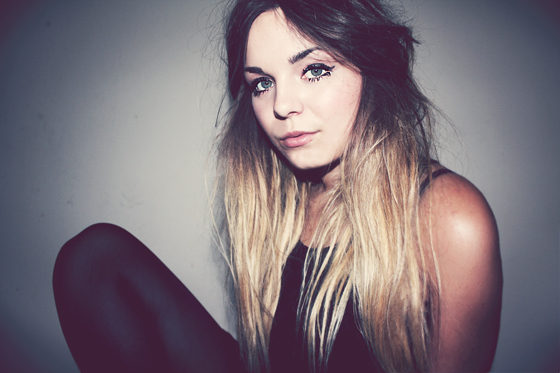 Your hair looks lovely with blonder ends, its a more summary style, love it. Iv just recently gone full on blonde and tried to ombre the ends slightly still, just to add a bit of interest to my hair colour. You should look into going full on blonde sometime like you were saying, I think your one of those people who are lucky enough to suit most hair colours. Congrat on your Uni results! I also lovelove your hair!